“] Edgar Fernando García was 26 years old, an engineering student, labor activist and member of the clandestine Guatemalan Workers’ Party (PGT) when he was seized by police agents off a street in Guatemala City and taken away forever. His disappearance left his young wife, Nineth Montenegro de García, and an 18-month-old daughter behind. It was February 18, 1984. On October 18, 2010, the trial of two policemen accused of participating in Fernando García’s abduction began inside a crowded courtroom on the 14th floor of the “Tribunals Tower” in downtown Guatemala City. By 9:00 a.m., when the proceedings got underway, people had filled the fifty seats available in the spectators’ gallery, with those unlucky enough to have arrived late lining the walls and crowding each other in the room’s single doorway. Behind a wooden barrier separating the audience from the court, three judges sat at a table on a raised dais overlooking the scene. To their right sat the defendants and their attorneys. To their left sat the prosecution, including the García family’s choice for “querellante adhesivo,” or “private prosecutor”: attorney Alejandra García, Fernando’s daughter. The trial is extraordinary in several ways. First, the indictments against Héctor Roderico Ramírez Ríos and Abraham Lancerio Gómez – as well as two other former policemen, Alfonso Guillermo de León and Hugo Rolando Gómez Osorio, both fugitives – were the first to be based on evidence found by investigators among records inside the Historical Archive of the National Police. Second, if the court rules against the defendants and it is upheld by the Constitutional Court, it will be the third conviction in Guatemala for forced disappearance – after the landmark Aug. 31, 2009 Choatalum decision and the El Jute ruling on Dec. 3, 2009 – and thus would establish a lasting precedent for future cases. That means that appeals would no longer be able to be made on the grounds that “forced disappearance” is not a valid or legitimate grounds for criminal charges. Fernando García in the diario militar. But the most interesting and groundbreaking aspect of the trial only became evident as the proceedings unfolded. Witnesses who had been called to testify about their relationship with Fernando García and events surrounding his disappearance spoke openly about his – and their own – militancy in the Guatemalan insurgent movement. It was the first time that people willingly exposed their links to the political opposition that was the target for state repression during the country’s 36-year internal armed conflict. I joined four other expert witnesses on behalf of the prosecution. Over two days (Oct. 18-19), the experts and six witnesses presented testimony and answered questions posed by government lawyers and attorneys for the defense. Although the men currently on trial are the agents who carried out the initial capture of Fernando García, the experts coincided strongly in their conclusions about the National Police’s centralized chain of command at the time of his disappearance, as well as the key role played by the Army high command in launching the operation and coordinating their forces with the police. "Governmental security services have employed assassination..."
My own testimony was based on U.S. declassified records produced at the time of García’s disappearance by the State Department and the U.S. embassy in Guatemala (some of them have been posted on the National Security Archive’s Web site). They describe a planned campaign on the part of the Guatemalan government to kidnap and kill trade union activists and student leaders linked to the opposition. 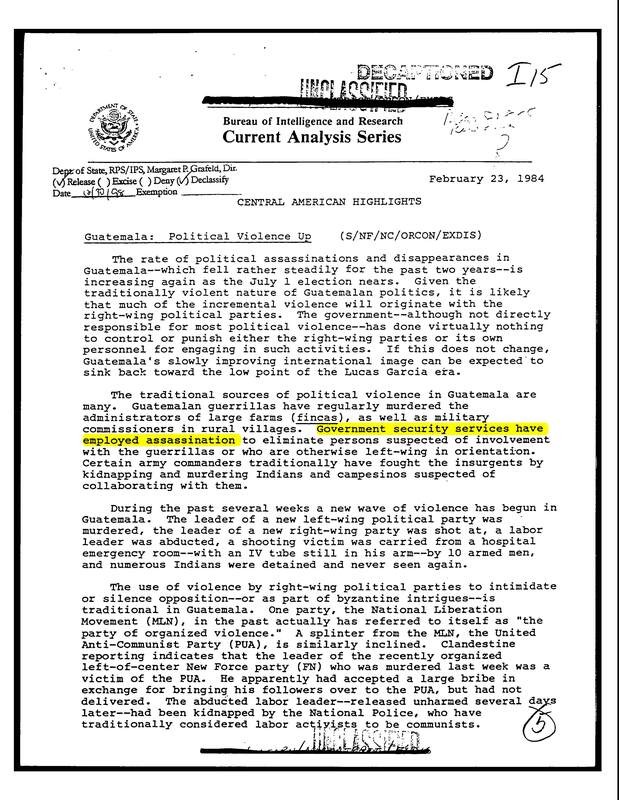 In a secret analysis written on February 23, 1984, for example, the State Department’s Bureau of Intelligence and Research reported a “new wave of violence” launched by military and police under head of state General Oscar Mejía Víctores, targeting a broad swath of Guatemala’s legal and clandestine opposition. “Government security services have employed assassination to eliminate persons suspected of involvement with the guerrillas or who are otherwise left-wing in orientation,” wrote U.S. officials, pointing in particular to the army’s “notorious presidential intelligence service (archivos)” and the National Police, “who have traditionally considered labor activists to be communists.” This and other U.S. documents provide context for Fernando García’s kidnapping as well as describe a pattern and practice on the part of Guatemalan security forces to use forced disappearance in their war against their political opponents. Daniel Guzmán, a statistician from the Human Rights Data Analysis Group of California-based Benetech, followed me as an expert witness, introducing the records contained in the Historical Archive of the National Police with a statistical analysis of the quantity and movement of documents found in the collection. According to Guzmán, documents concerning the Fernando García case flowed between entities high in the chain of police command (such as the Director’s office, the Police Corps commanders and the Joint Operations Center) at twice the rate that occurred within the estimated 31 million records produced by the National Police between 1960 and 1996, the years of the armed civil conflict. 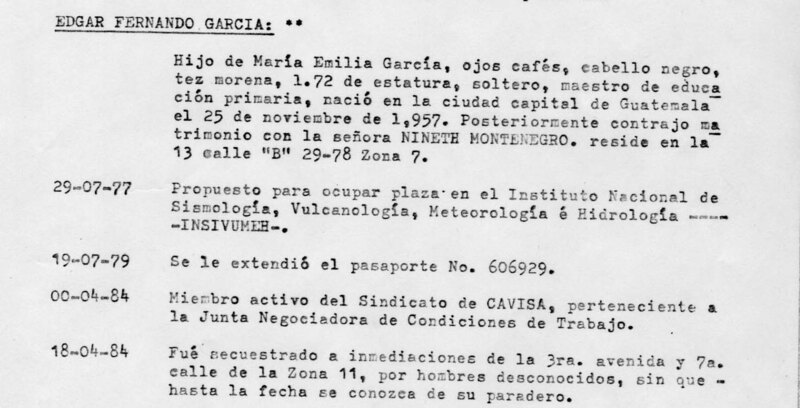 His conclusions helped define the universe of police records consulted in the investigation into the crime and offered supporting evidence of the involvement of senior police and military structures in the planning, design, orders and oversight of the operation that resulted in García’s abduction. The most extensive and important expert testimony of the day, however, came from the Police Archive’s own investigator, Velia Muralles Bautista. Muralles described and displayed on a screen set up inside the courtroom images of some of the key records found in the police archive related to the crime. Her presentation provided chilling bureaucratic details behind the “cleansing operation” (operación de limpieza) launched by the army high command and National Police on the day of Fernando García’s kidnapping. As Muralles walked the judges through dozens of records leading up to and including the day of the disappearance, everyone present was able to examine projections of the surveillance files tracking García’s movements beginning in 1978; intelligence reports describing CAVISA, the trade union he belonged to, as a subversive organization; orders sent by the army general staff to prepare for the operation in January and February 1984; records from the Joint Operations Center (Centro de Operaciones Conjuntas: COC) commanding which units would be involved; and a hand-drawn map of Guatemala City, with Zone 11 – the area where García and his companion, Danilo Chinchilla, were captured – assigned to the Fourth Corps of the National Police. The document with the most immediate impact on the proceedings was a recommendation from the National Police hierarchy that the defendants – Ramírez Ríos, Lancerio Gómez, and the two fugitive police agents – be considered for a medal for their heroic actions on the day, at the time, and in the place of the capture of Edgar Fernando García and Danilo Chinchilla: “On February 18, 1984, at 11:00 a.m., while carrying out an Operation in the Guard’s Market, Zone 11, they were attacked by two subversives, from whom they seized subversive propaganda and firearms.” The testimony given by Muralles was extraordinary in the depth of its analysis, and established beyond doubt the firm control in the hands of the most senior officers of Guatemala’s army and police institutions of the operation that ended with Fernando García’s disappearance. 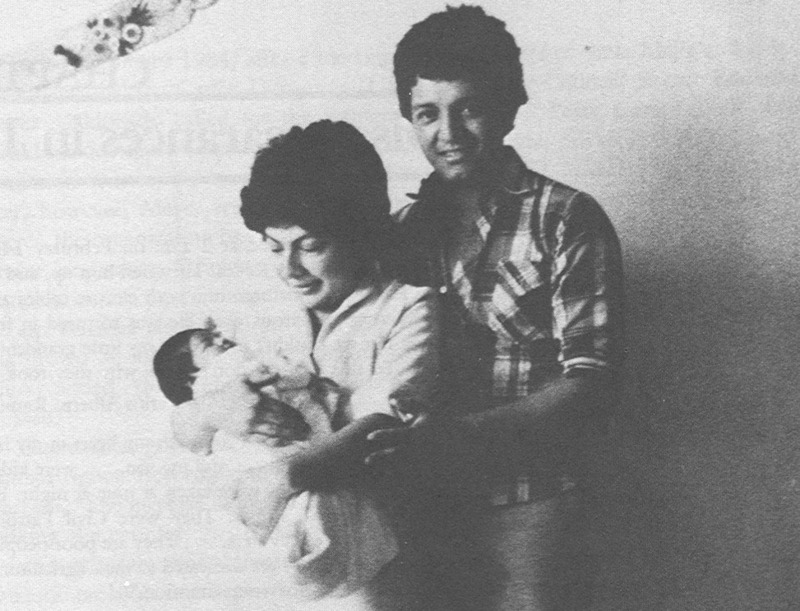 Ana Lucrecia Molina Theissen, whose 14-year-old brother was disappeared in 1981, was the person Fernado and Danilo Chinchilla were on their way to meet when they were seized by police. It was Molina Theissen who first told the court of García’s militancy: “We were members of the Guatemalan Workers’ Party (Partido Guatemalteco de Trabajadores: PGT).” Her testimony was an astonishingly brave and open acknowledgement of the political activities that she, García and Chinchilla were involved in. To a hushed courtroom, she recounted how she arrived late to her planned rendezvous with the two men and found them gone. It was only the next day that she learned what had happened. “It was a very hard blow,” she told the judges. Witnesses Iduvina Hernández and Aura Elena Farfán described a missing piece of the puzzle of that day in telling of the fate of Fernando’s companion, Danilo Chinchilla. Although both men were shot by police when they tried to flee the marketplace, Fernando was spirited away in an unmarked car while Danilo was taken by ambulance to a local hospital. Hernández played for the court an audio tape of an interview conducted with Chinchilla days after incident. In it, he recounts in minute detail how the operation unfolded, as police agents and armed men in civilian clothing swarmed around the two in the middle of the crowded street. After Chinchilla was transported to Hospital Roosevelt, he lay wounded in a bed surrounded by his captors. In fear for his life, he managed to smuggle out a note to a companion begging to be rescued. The nurse who carried the note for him was Farfán. She gave it to her brother, Ruben Amilcar, who successfully organized a rescue operation with the help of some of the hospital staff. Ruben himself was disappeared months later, on May 15. Danilo, who survived his first encounter with the police, was recaptured and killed later that year, along with his companion. After ten hours of wrenching testimony, the judges called a recess until the following day. We reassembled in the courtroom on Tuesday to hear the final two experts, Rember Larios – a former member of the National Police who added his own assessment of the police records and their implications for the senior tier of police and military officials involved in the crime – and Fernando López, who gave his expert analysis of habeas corpus law at the time of García’s disappearance. Thus ended the first phase of the Fernando García trial. The trial resumes this morning with the last witnesses to present and the lawyers’ arguments. Stay tuned. thank you very much for this report from Guatemala. chilling, and terrifyingly awesome… WELL DONE, great work… my hope: over-due justice is served!! Great piece of work. It’s particularly interesting to see the US DOS files as they become de-classified, not least because they contradict completely the Embassy/DOS line back in the 1980s. What an amazing description of a landmark trial. I felt like I was in the courtroom watching this historic event. I could visualize the documents that Velia displayed for the public to see. It is historic in so many ways that you described so eloquently; the use of the archives, setting the legal precedent on forced disappearance, and the open discussion on past militancy. This history is so important to truth, reconciliation, and justice, and the archives are there so people can remember what happened in the past. Nunca olvida. Thanks for your tremendous activism, Kate. On behalf of my whole family I thank you for your excelent work, a substancial contribution to my brother’s claim for justice, and to the advancement of law and peace in Guatemala. As crazy as it may sound, as I am going through all these documents, I feel like I’m watching a T.V. series, and I don’t even want to get off my chair, so I can continue watching.. will not give up..
finally got the bravery tto go ahead and give you a shkut out from Austin Texas!